The holiday season is well and truly upon us, although the Irish weather doesn’t seem to have got the memo! I love reading about other people’s holidays, having a look at their holiday pictures on Instagram and I’ve written one or two posts of my own about holidays. What we rarely see though is accounts of our WORST holidays. While all holidays, especially with kids, will have its good and it’s bad bits there are some holidays that are just misery, ones where you want to beamed home and the memory to be wiped immediately from your brains. Well I’ve decided to blog mine, which happened back before I even knew what a blog was, and I’m setting it up as a linky if anyone would like to join in and share their holiday horrors. Our first holiday as a family of four was a staycation in the sunny south east, it was a chance for me to return to the beaches of my childhood and introduce our daughters to this part of Ireland. We decided to book a self catering cottage on the grounds of a hotel that had a pool and a small playground. A mix up on our booking meant that when I phoned to change a part of it, it turned out that we weren’t booked in, not a great start but at least it was rectified before we arrived. Things seriously nosedived when we did arrive. 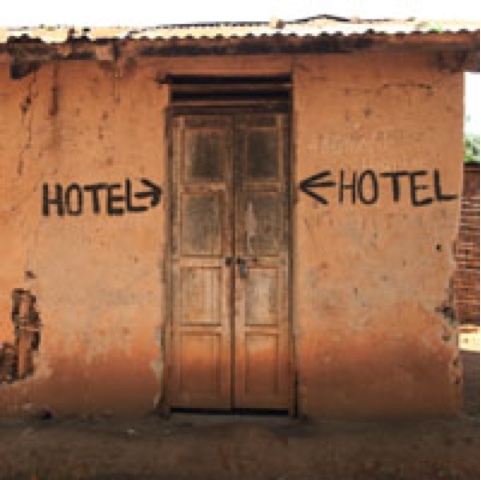 The hotel that had looked dated but ok on the website turned out to be worse than expected. There was that hideous pine panelling everywhere and the reek of fried food permeated the lobby. Our ‘cottage’ was possibly the worst self catering I’ve ever stayed in. Old fashioned puts too nice a spin on it, it’s was cramped, dirty and the fridge in the galley kitchen was covered in rust. The only place to eat was at the table under the stairs, my 6 ft 1 husband was suitably impressed with this!! The girls were in separate rooms as they were still too young to share and not disturb each other but on the plywood wall between the doors of their rooms was perched the TV, which meant no TV could be watched after they went to bed, at 7 o clock, as the noise and woke them. I had booked a babysitter ,through the hotel, for one night so we could go for dinner in Dungarvan but we both concluded that if their cleaning staff were an example of the hotel employees we really couldn’t trust their judgement…no fancy grown up dinner for us then. It rained or drizzled most days, I persisted with a trip to the beach, that beach where most of my happiest childhood holiday memories were formed, the girls obliged by trying to catch crabs, build sand castles and ignore the freezing wind, a hastily purchased wind breaker meant I nearly had a Mary Poppins style airborne moment while trying to set it up. When the youngest girls lips turned blue I finally conceded and packed up and returned to the house. Our youngest girl wasn’t long out of her cast for hip displaysia and really hated being in the car but due to the crappiness of the hotel car trips were a necessary nightmare. One such journey to the Waterford Suir Valley Railway resulted in 40 minutes of wailing followed by the train trip that saw the loss of one shoe and one fleece…and expensive experience and that’s not even taking into account the damage to our hearing. Another hopeful trip to the church where we got married in East Cork resulted in a similar disaster because when we got there and a kind man offered to take a family picture, well both girls were wailing…ah if only we had known the joy that was ahead of us as we headed up the aisle like two innocent eejits!! The only enjoyable part of that trip was having lunch outside together while both girls slept in the car parked in front of us. We finally gave in and, four days early, packed up and headed home. We spend a lovely afternoon in Kilkenny on the way back, we did some great day trips on the remaining four days, from the luxury of our own home and had our babysitter come each evening so we could go out for dinner. Those last few days, holidaying at home, saved that summer. Many, many lessons learnt from that holiday, thankfully we’ve never had such a crappy one since. Holidays,while great, are not always what they are cracked up to be! If you’d like to join in and share your holiday horrors then click the blue button to add your post. Oh that's sounds awful! There is nothing worse when the accommodation just isn't comfortable or clean, makes you dread going back! Next Next post: Will I Cry?